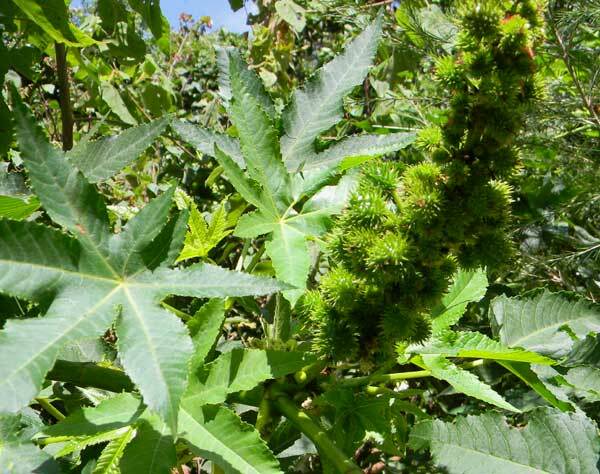 Herbaceous plant about 3 m tall, probably grown as an ornamental, at Naiberi River Camp, Rift Valley, Kenya, Africa. November 2010. Blooming is complete here and the fruits are developing. SHRUBBY: Herbaceous above, but becomes woody and tree like below as the plant ages. Plants several meters tall are not uncommon. FLOWERS: The flowers are of two kinds, male and female. Within a spike of numerous flowers, the males are lower on the stem and have abundant yellowish-white stamens. There are no petals. The larger green flowers higher on the spike have conspicuous red stigmas when blooming and then give rise to spiky fruits each of which contain usually three seeds. LEAVES: Smooth, often shiny leaves are large with 7 to 11 radiating triangular lobes. The margins are sharply serrated. Leaves turn reddish with drought or cold. RANGE: This plant is native to the Mediterranean region and eastern Africa. It has been cultivated throughout tropical and subtropical areas. FRUIT: Each fruit capsule has three compartments containing one large seed, sometimes incorrectly refereed to as a bean. UNARMED. The seed containing fruits are covered with rather sharp prickles. In addition the plant is well known for its toxic properties. Copyright Michael J. Plagens, Created on 15 November 2011.